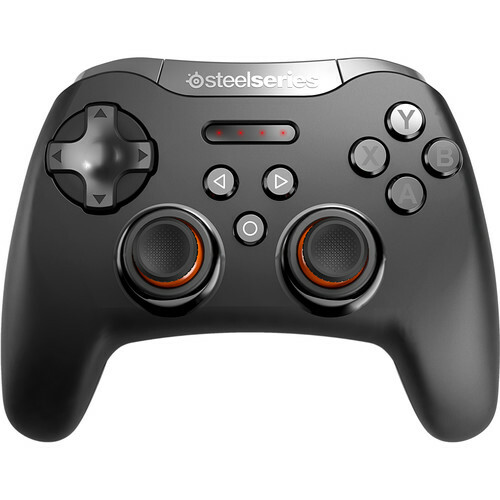 The SteelSeries Stratus XL Wireless Gaming Controller is a full-sized Bluetooth wireless controller built for gaming on Windows and Android platforms. It is designed based off two of the most notable console controllers, with a D-pad, four ABXY buttons, two clickable analog sticks, and four shoulder buttons. Ergonomically crafted, the controller fits comfortably in the hands and remains so even after hours of gaming. Other features include over 40 hours of gameplay with just 2 AA batteries (included), four status & connectivity LEDs, and complete customization of the controls via SteelSeries Engine 3 software . Additionally, a dedicated switch on the controller lets you switch from Android or Windows. The Stratus XL Wireless Gaming Controller supports over 2,000 fully controller-enabled game titles available on Steam. The Stratus XL is designed after two of the most recognizable video game controllers, and is ergonomically crafted to fit comfortably in your hands even after hours of use. Strategically placed buttons prevent hand cramps and ensure that no button is out of reach. Swap from Windows to an Android device with the dedicated platform switching button. Simply click it and you're ready to use it with another Bluetooth enabled device. Turn off the controller when it's not in use to conserve battery life. Download SteelSeries Engine 3 software to configure the Stratus XL. Box Dimensions (LxWxH) 7.5 x 6.3 x 3.4"
Stratus XL Wireless Gaming Controller for Windows and Android is rated 5.0 out of 5 by 4. Rated 5 out of 5 by Ericmky from Very Good Product I use with a Gear VR and S7 Edge device. The Stratus XL is great, very well built and work perfect with my device. Rated 5 out of 5 by kevin from perfect for steam Easy to connect with Bluetooth on my laptop had zero problems while gaming and using it on big picture mode for steam feels just like a console. Rated 5 out of 5 by Marc T from Great device Had zero issues, Turned it on Bluetooth searched on Samsung Galaxy 7, found it and synched perfectly. Rated 5 out of 5 by Jumol from Thunbs up Great product as described! Does it have a phone clip to play without vr? This controller does not have a clip for your phone as it is designed to for use across various platforms except IOS. does this work on Windows 10 and could it work for downloaded Emulators? Yes! this work on Windows 10 without any issues as for the emulators you will need to do the mapping within your emulator application.